INVITES FAMILIES TO GO AROUND THE WORLD! Los Angeles, Calif. – March 2018 – Air Bud Entertainment, the proud creators of beloved family entertainment, including ‘Air Bud’ and ‘Disney Air Buddies,’ announces the biggest doggone adventure of the year, with an exciting all-new addition to the hugely popular PUP STAR live-action film franchise -- PUP STAR: WORLD TOUR. Debuting on NETFLIX and Digital HD, May 5, 2018, the fantastic family film takes audiences around the world, as the action-packed spin on popular TV singing competitions goes global when ‘Tiny,’ the adorable singing Yorkie pup, packs her bags for far-away places from Africa to India and beyond. Along the way, Tiny and her fellow judges find a rich tapestry of fantastic new songs and meet exciting new canine singers, including ‘Julio, a Mexican heartthrob who’s not all he appears to be, but ultimately helps them discover that music really is the universal language that brings us all together as one pack, one voice, singing in harmony! 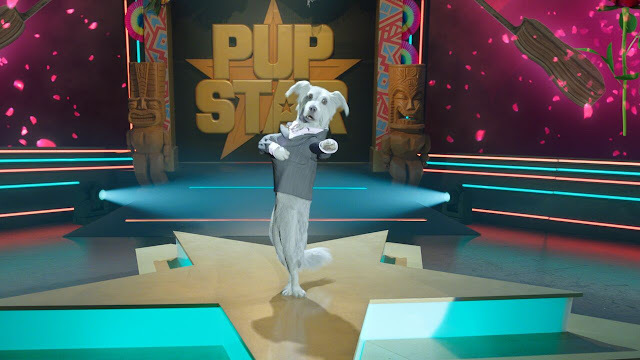 Featuring a soundtrack of paw-tapping new songs, PUP STAR: WORLD TOUR is the newest feature-length addition to the popular dog-filled PUP STAR family film franchise. The franchise launched in 2016 with overwhelming hit PUP STAR and continued in 2017 with PUP STAR: BETTER 2GETHER, which recently (3/23/18) had its world broadcast premiere on Disney Channel. Both films are currently available on NETFLIX. A tail-waggin selection of talent returns to provide voices for the film’s canine stars, including top music icon Ziggy Marley (as ‘Dog Gnarly’); John Ratzenberger voices ‘Grandpa Growl; YouTube sensation Mackenzie Sol (The X-Factor) returns as ‘P.U.P’; and 13-year old singing sensation Kaitlyn Maher (America’s Got Talent) returns as the voice of Tiny and sister Scrappy. The film also returns the voices of George Newbern, Diedrich Bader, Nikki Blonsky, Steve Valentine, Brian Hull and Jonathan Mangum. Exciting new vocal talents include Maulik Pancholy (30 Rock) as ‘Raji,’ the slumdog crooner from India; and Jorge Diaz (Disney’s Elena Of Avalor) as ‘Julio,’ the Mexican heartthrob. PUP STAR: WORLD TOUR is produced by Air Bud Entertainment, the creative force behind the #1 live-action, direct-to-home movies in the family category. The film is directed by “Air Bud” and “Disney Air Buddies” veteran Robert Vince, produced by Anna McRoberts and written by Robert Vince. Official (FULL) Film Synopsis: PUP STAR is back and bigger than ever as the hit singing-pup competition show goes global! 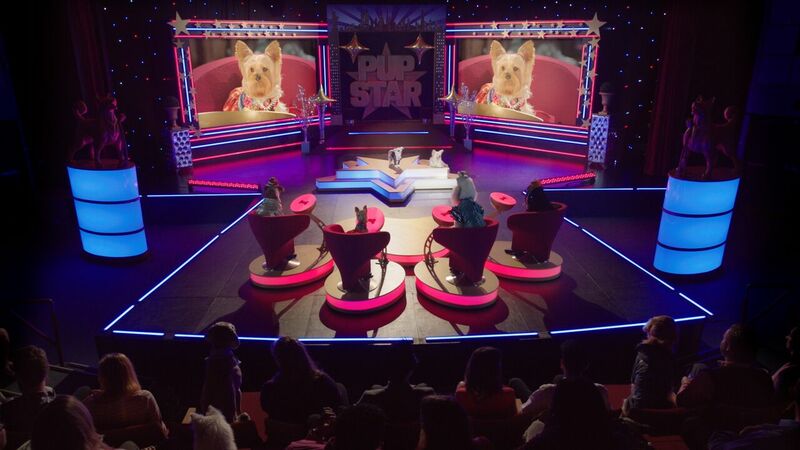 After achieving international stardom, Tiny the adorable Yorkie joins the celebrity judges for the first-ever Pup Star World Tour. The judges each welcome their favorite contestant from around the world to the Pup Star pack, training them to compete for the new title of global pup star champion. India's Raji joins Team Growl, China's Ming joins Team Paw-Paw, Nigeria's Mobo joins Team Gnarley, and Mexico's dashing telenovela star Julio joins Team Tiny. Talented, irresistible, and massively arrogant, Julio throws a wrench into Tiny's personal life when he invites himself to stay with the family in Chicago while they rehearse for the grand finale. But while Tiny’s distracted by her protégé, Bark, Roland and Kano have other plans. The Mean Team are up to their old antics, doing everything they can to take Tiny down and regain control of Pup Star. Air Bud Entertainment is the premium brand for live action family movies and TV series. The Company has created over 22 family movies and five movie franchises that are licensed around the globe including the five Air Bud movies; seven Air Buddies movies with two Santa Paws movies in partnership with Disney, along with the new four movie Pup Star franchise for Netflix. 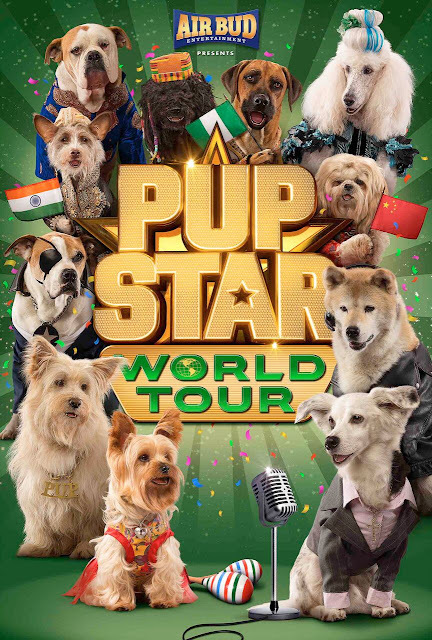 ABE also recently announced its new series Puppy Prep Academy with Disney Channel in the U.S.
PUP STAR: WORLD TOUR has a running time of 87 minutes and is not rated. Disclosure: I am posting as an influencer for JGoldsteinPR.